This was taken just outside of Banff, in Canada. Apparently this is the turn off from Banff, Alberta to the # 1 highway to Calgary. 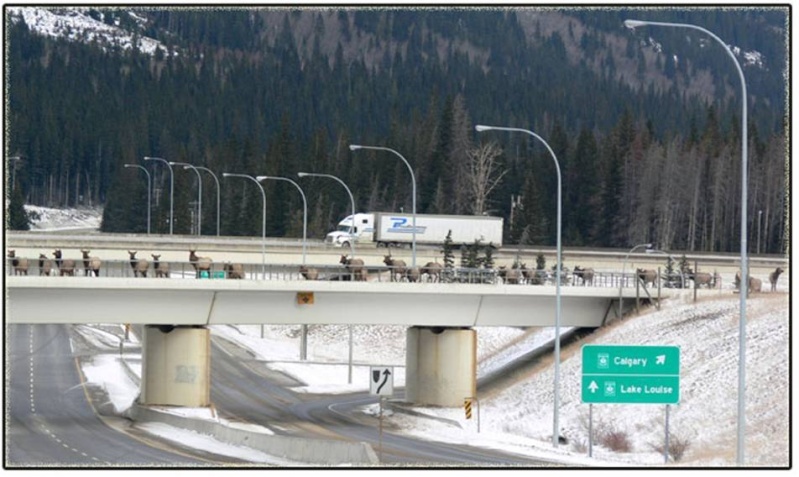 They built the animals their own crossing (especially the elk) because that was where the natural crossing was and after the highway was built, there were many accidents. How great is this pic?...who says animals are stupid??? love it. the only animals to think that other animals are stupid are humans! Not all humans think like that tho! Saves the animals and humans alike! This is really cool. It reminds me of the pacific hwy between Newcastle and Brisbane- mostly just past Newcastle there are these big wire mesh 'bridges' over the road and they're for the animals, koalas etc to climb over the traffic. It's nice to know that sometimes things are done to help animals in situations where they could come to harm. Thats a really cool pic, and what a great idea with the mesh Kate! !